“How Many Am I Hiding?” is a math game that will help preschool and kindergarten children practice number concepts and simple subtraction. Find more Number Activities for Preschool here. This is a very simple math game we play during small group time. My small group has around 4-6 children. 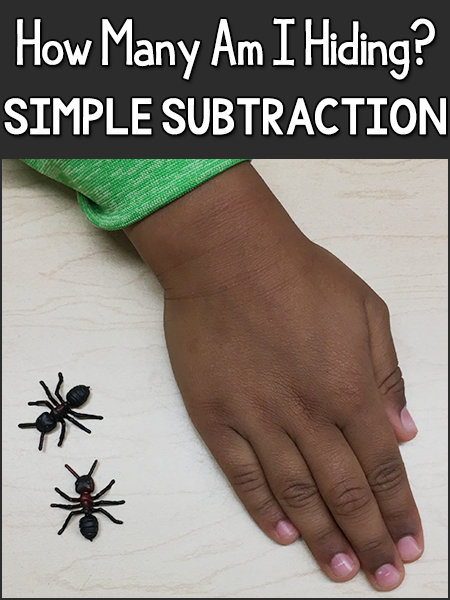 For this subtraction math game, we used plastic ants. Any small item is fine, I’ve used plastic ladybugs, flat floral gems, mini erasers. There are many things that could be used, and could easily match your theme. I start the game with 4 plastic ants. Then I also hide all and none and let them see how many are still visible. After I go through and demonstrate how it works, then the real game begins. I secretly hide a certain number of ants and have the children tell me how many I’m hiding. To do that, I put my hand over all 4, then slide my hand away with some under my hand. I make sure to explain to children that this is not a guess. They can use their brain to think of the answer. They mentally take away what they see from the amount you started with. Most children do well with this subtraction game by the end of the year, but I have tips you can use for those who are struggling. I go through the game many times, giving children opportunities to tell how many I’m hiding. If I have a child not participating, I then go around the table and give each child a turn one by one. If I have a group that is struggling, I’ll try the game with only 3 ants. If they all catch on quickly, I’ll try the game with 5 ants. Sometimes it also helps to add manipulatives that are different. For example, I might use 3 big ants and 1 small ant, or 2 big ants and 2 small ants. That helps some children visualize and work with larger amounts. If you use flat floral marbles, you could use 3 blue and 1 pink or 2 blue and 2 pink. After children have caught on to the game, I let each child in the group take a turn to hide ants for the other children to guess. They love it when they get to hide the ants, especially if they can “trick” the group. I typically have children who catch on to the game quickly and easily and a few who struggle with it. It’s often the child I would least expect to struggle. To help a child who is struggling, you can give them the same amount of counters to hold and manipulate on their own. They can take away the amount they don’t see to figure out the answer. Love this game! It’s so versatile, too. I’m going to play it with some tiny rubber dinosaurs since we are studying dinos right now! Thanks for sharing, Karen! Thank you, Corinne! And I have to add: You are a rock star artist! 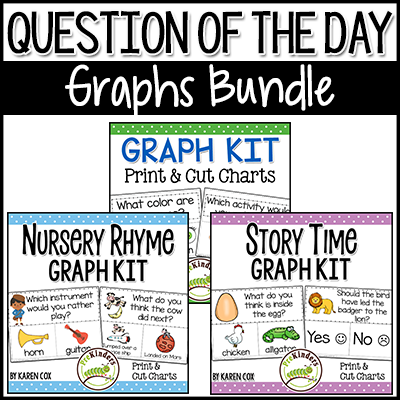 Your clipart helps me make many of my printables! Thank you! The activity is fun and interactive. Very clean and direction is easy to understand. I love the tips that you shared with this game. They will be very helpful when I try this game with my class. Thank you! Thank you so much for explaining how this activity can be used with children of differing levels of understanding quantity. I will try this with my four year olds next week! Hi Karen, Thank you for reminding me of my school days where I was playing with my friends the same game. It is a unique and simple game, every child can involve and can understand this games very well. I love this. I really like that the children don’t have to guess, they can use all those thinking skills they have learned this year. Hi, Karen! Big fan. Thanks for sharing! I can definitely see how this will help out my kids. Subtraction is a little more challenging to introduce to the little ones, compared to addition. Thanks again! Excited to try this out next week!